Several weeks ago, I wrote about pumpkins and how to roast and use up whole cooking pumpkins. One of the things that comes when roasting up whole pumpkins for puree is the “pumpkin water” that you strain off. This “water” is inherently sweet, or at least as much as the pumpkin itself. I’ve been known to use it as a liquid base in smoothies, or cook it down with spices to make a simple syrup. 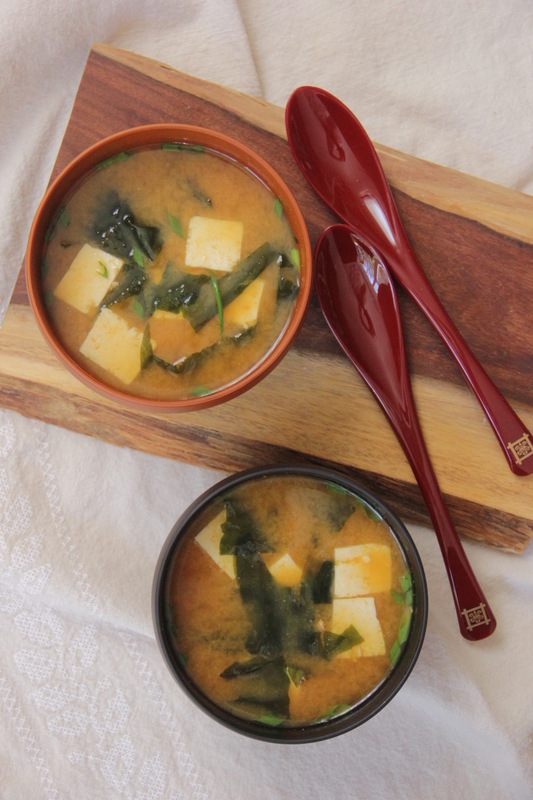 On cold winter days however, I enjoy nothing more than using it to make a simple miso soup. 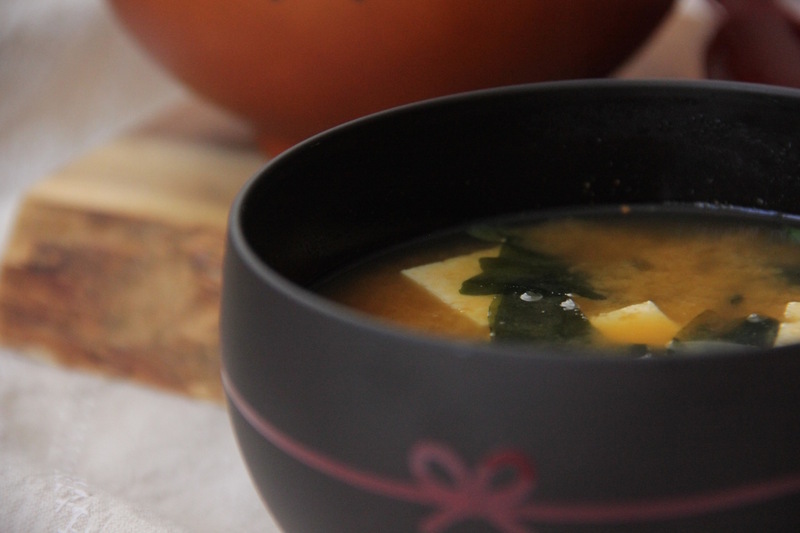 I will – somewhat quietly- admit it: when I first moved to Japan, I didn’t like miso soup. The soup there is nothing like the watery, flavorless “miso soup” we are served here at fake Japanese restaurants (which at that time I loved). 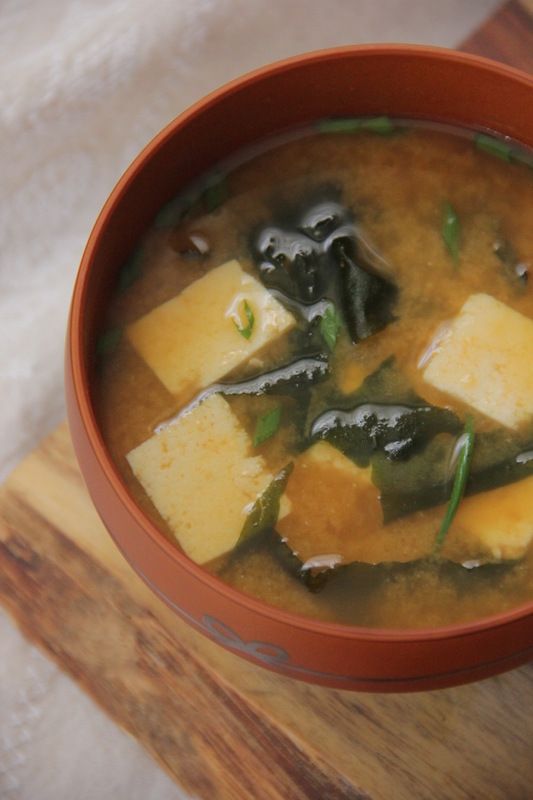 There are many different kinds of miso paste in Japan, and they differ in different regions. 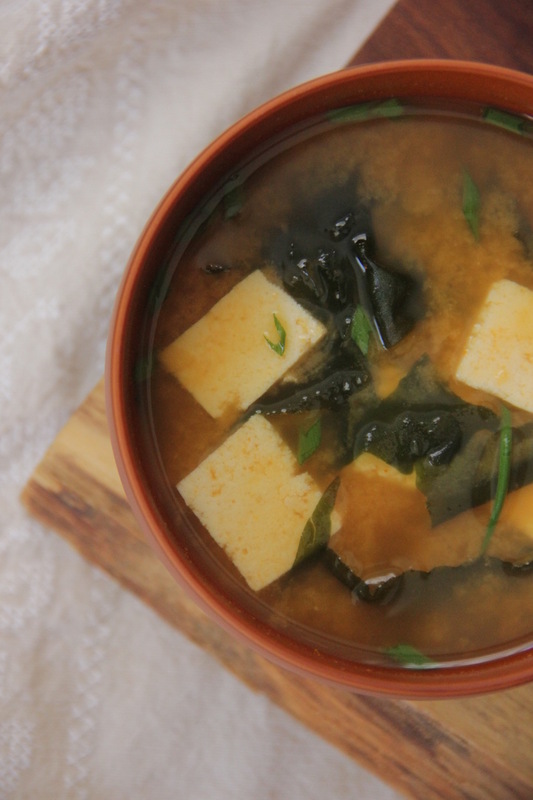 Where I lived, aka-miso was the prevalent miso used and it had a much stronger, deeper flavor- a flavor that I initially didn’t like. While I initially disliked it, I quietly ate it, as it was served at almost every meal (including breakfast). The fillings and toppings would vary based on what ingredients were around that day, and over time I grew to love it. 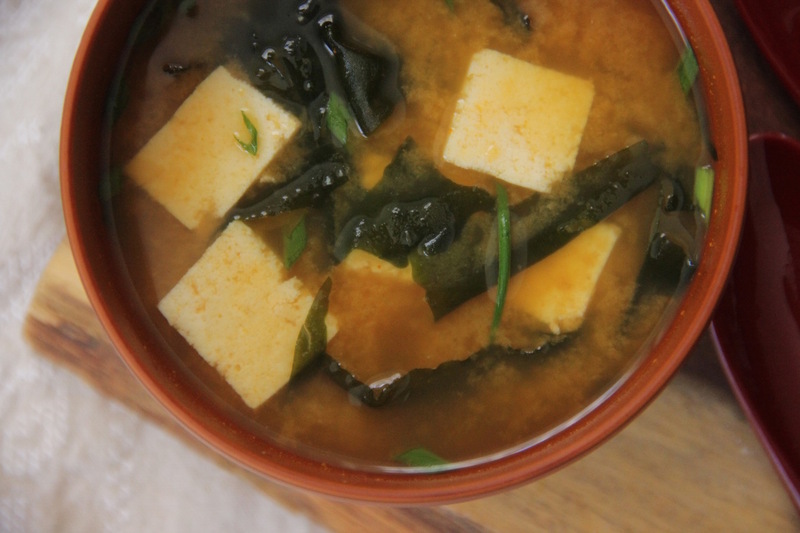 Upon returning to the states, it came to be a flavor that I craved and when I was in Japan this past summer, I sought out miso with my meals. Even the “just add boiling water” ones from the convenience store were better than what we have here in the states! In all honesty, I have never had a “pumpkin miso” variety in Japan, but I like using up the pumpkin water as the dashi liquid base in the simple staple. On cold winter days, it’s a calming dish to make as a side or an appetizer (or even breakfast!) and it’s very simple to make! Please note: As different pumpkins have different sweetness, it will affect the sweetness of the stock, so keep this in mind when you add the cooking sake and soy sauce, as you may need to adjust the measurements slightly for a better balance of flavor. Start by putting the dried wakame into a large bowl with some cool water to leet it rehydrate. Take the pumpkin water, water, kombu, cooking sake and soy sauce and put it in a medium-sized pot and begin heating it on medium-low. You want to bring it to a light simmer. Meanwhile, chop up the silken tofu into 1/2 inch cubes and thinly slice the scallions. Once the soup begins to simmer, return the heat to low and allow it to simmer for 20 minutes. Remove the kombu and turn off the heat. 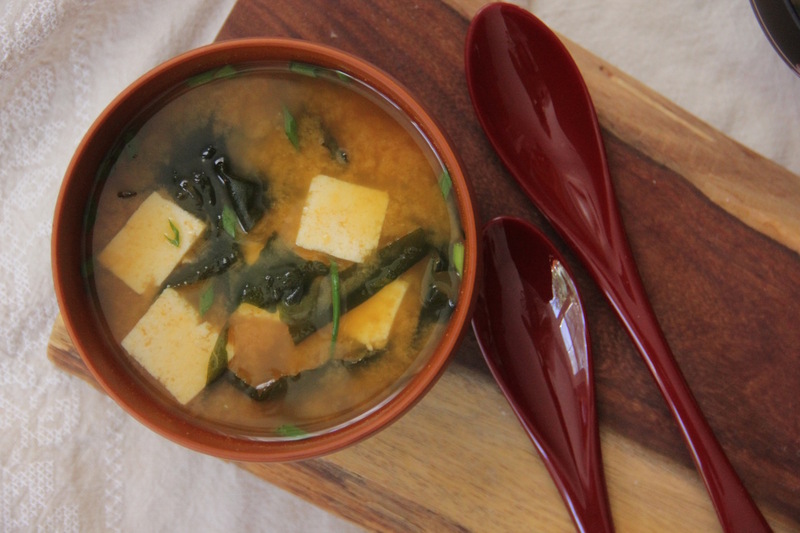 Stir in the miso (you may need to whisk it a bit) and add the tofu and drained wakame.